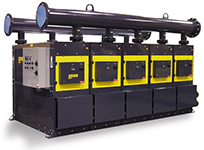 Rasmussen Air and Gas Energy services and supports a full line of dryers. Industry wide solutions range from 11 to 19,200 SCFM. Interested in learning more about Dryers?